OMG. These Chocodiles. These Chocodiles. OMG. It has been FOREVER since I have had one of these. I could only find them on the west coast back in the day. 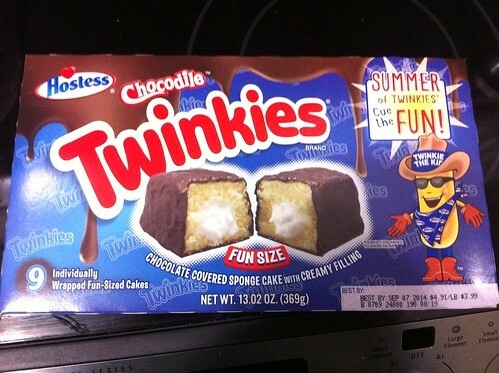 Hostess is GENIUS for making them available nationwide. Back in the day, they were only available if you lived in an area close to one of their plants or overstock shops. The chocolate would not travel well sitting on trucks for days to cross-country – so they were only available locally. But now that Twinkies and other Hostess items are all shipped frozen or cold storage – they can now find their way into everyone’s home. If you have read this blog at all you probably know I am a ZINGER person. I don’t even really like Twinkies…but something about simply dipping them in chocolate makes them a ZILLION times better. I found these only at Walmart for right now….